These safe + effective (and adorable!) diapers will help keep your baby's sensitive skin protected and dry. The ultra absorbent core in Seventh Generation diapers, made with sustainably-sourced fluff and 0% chlorine bleaching, helps prevent leaks. They design these diapers to care for your baby as well as the health of the next seven generations. **The inks they use are free from lead and other heavy metals. These used to be our favourite diapers and have used them for both our children but the lastest batch we received are horrible. Seventh Generation changed them, not just the print but the design/material is new and for the worse. The new ones are thinner, leak and donâ€™t stay up on my 2 year old. So sad because the old ones were amazing! The only thing nice about these are the new cute coloured print on the diapers. Hope Seventh Generation goes back to the old design/construction! Love and recommend these diapers, cheapest eco-friendly brand, we use them at night. The only detail is that the absorbant layer inside gets crumbly and hard if we use the same dry diaper all day (we do EC elimination communication). I love when people notice these diapers and I get to tell them about this product and company. They are just as absorbent but better for your babyâ€™s skin and the environment! Love these diapers. I love that they are not scented at all (until there's a toot, that is). The regular type makes it through the night with my toddler. Sizing is also quite good although I get more leaks when my little gets to within 5lbs of the upper limits. They have been a great options for when I am not able to cloth diaper. I wasnâ€™t entirely sure these would work because of some negative reviews but my, my, am I glad I tried them! No leaks, no weird smell, super cute design, soft... overall great diapers! A great choice for a disposable diaper. Fantastic diapers, great company! Used to use cloth diapers on my first boy, second not in seventh generation full time. I find they fit a bit small, the size 6's seem smaller than'conventional' size 6 diapers..but it actually encouraged my eldest to toilet train earlier when it started to leak a bit and i explained they don't go any bigger for big kids! I love these diapers. No leaking and gentle on my daughter's skin! Best diapers. They never leak! Love them for my sensitive son, they do leak a little more than the honest company but are more cost friendly. These diapers feel rough and irritated my poor little girls skin on her back. They also did not make it through the night without leaking and one night we had quite a blow out as a result. The designs are cute but overall not worth the price for us or the discomfort for our little girl. I really like the design and that there is no smell but we have already had 2 leaks and have only used the diapers for 3 days! My daughter is 23lb so ordered size 4. Maybe I should have ordered size 5? I was really hoping these would work for us. Disappointed. Great diapers! Never leak, even overnight. Fit a bit small compared to other diapers. These are my favourite diapers! Baby has had no rashes. I switched over to another popular brand (**ggie*) for a week thinking baby is old enough to stand up to what ever is in those diapers. Boom! Baby started getting a rash. Of course I can't say that it was the diapers that caused it, but I am switching back to Seventh Generation. 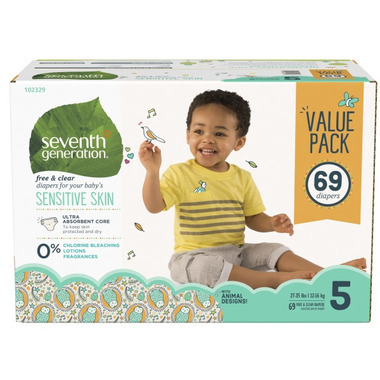 Seventh Generation is my favourite diaper brand. We use these when not cloth diapering (away from home and for overnights). The best diapers ever. We use these in the day and seventh gen overnights for evening. Not bulky, eco, safe, soft, cute. 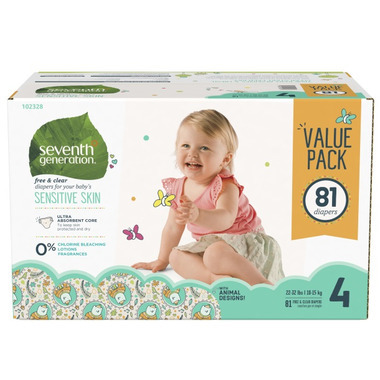 We tried almost all the disposable diapers on the market since my baby was born and Seventh Generation is one of my favorites. No weird smells. Beautiful design. We use these as overnight diapers with a 2 year old boy. They are great! No leaks and no rashes! I've been trying all the "green" disposable diapers since my baby was born and Seventh Generation is one of my favorites. Great absoportion and decent price. It runs a little bit small so I recommend buying one size up. Absorbent and no weird smells. I can always count on them to do the job! Always happy with these. Even through the nights. Huge fan of these diapers. I use cloth diapers on my little one but use Seventh Generation for nighttime. Diapers give me peace of mind that I am not exposing my kids to harsh and unnecessary chemicals and they hold up well to heavy wetness. We have never experienced leaking. I would recommend this brand over and over. The only diapers my son doesn't try to take off! And I love the lack of toxic ingredients on my son's bum! Love these diapers! They don't have a chemical like smell to them which I've noticed with other diapers and they last all night with our baby (7pm to 7am) with no leaks!! I've noticed we need to size up a little earlier than recommended but could just be our baby. Favorite diapers by far, I stock up every time they go on sale! Love these diapers! My little one had bad diaper rash and after switching to these it instantly cleared up! They are soft, absorbent and prevent irritation. As absorbent and confy as Pampers, and more natural. They are great! They are absorbent, comfortable and prevent irritation with my little one. They are the best diapers out there. I always buy these when they go on sale. They work well and seem comfy. These diapers are great!! We never have leaks, even overnight. I love that they're non toxic. These are terrific. They've all I've used since my daughter was born. They're durable and reliable. I bought these out to try because I am dedicated to natural/biodegradable diapers and I was thinking there would be a trade off, but there isnâ€™t! These diapers work well, no blowouts and no rashes. Win/win! I've been trying different disposables for when we're not using cloth and these have become our top pick. Price is right. They hold up well. I do like the prints. And they don't both my little one at all. Great diapers!! They absorb super well and my son can go most full nights in these without any leaks! Never had a diaper rash. They are a great price too and go on sale a lot! I always stock up. Used to use Honest diapers and these are very similar but much more affordable in Canada!! These diapers work perfectly for us, love the brand. Love these diapers! No leaks and fit so well. I bought these diapers for my baby granddaughter. They are superior to most diapers on the market. Their absorbency is incredible yet no diaper rash! They are expensive so sale prices are very welcome. These are the best diapers. We have tried everything to help with diaper rash and these do the trick! No leaks and keep baby dry! Great diapers! I didn't like 2 others brands that I tried, so I'm sticking with these ones. The value pack is a great price as well. Love this brand for our grand babies.